Every wondered why you have completely dropped off the Google index? If you ever get a little love letter from Google telling you that your site is not complying with Google’s quality guidelines then you may have fallen victim of a hacker and someone else’s blackhat techniques . 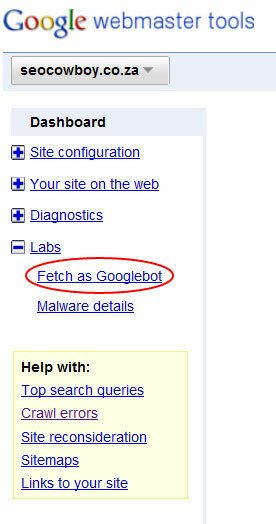 This can be tricky as the hackers may make the hack invisible to the user and only visible to the GoogleBot. Your page may appear in the search results with a completely different title to the one you have on your site or it may be pinging the GoogleBot over and over again with random information not related to your site. Create a webmaster tools account: Simply go to this Webmaster Central page and click on Create a new Google Account. Once Google has sent you a verification email you can then log back in to Webmaster central. Add your site to the profile: click on the Add a Site button and enter your website address. Then verify you have permission to access your site by either uploading an HTML file or adding a meta-tag to your site. (Get help from your webdesigner or SEO specialist if you are not sure how to do this. Finding the Problem: Now look through the code and try to identify code that should not be in your content. If your title looks different then you have been hacked and need to address the problem. Been Hacked? : If you have indeed been hacked then you will need to visit this link to sort it out. My site’s been hacked – now what? Identifying if you have been hacked is the first step, if you have been hacked your will need to located the source of the hack and eliminate it. There are many possible ways of being hacked so best you ask a professional to locate it and fix it.